Four-legged robot BigDog now sports an arm powerful enough to lift and throw breeze blocks. 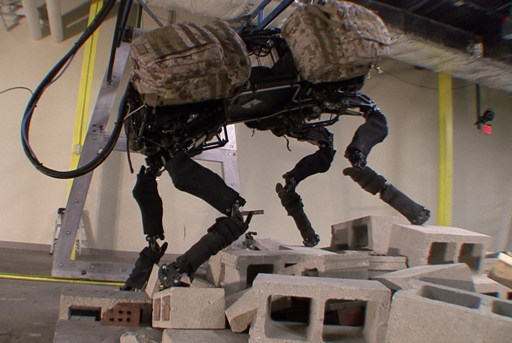 Made by US robotics company Boston Dynamics, BigDog is backed by the Pentagon. BigDog was designed primarily for military use, and the arm could help soldiers pick up and carry heavy loads. But one robotics expert said the technology’s potential was “enormous” for use in other areas, such as search and rescue. BigDog is one of several robots created by the Massachusetts-based firm and funded by the US Army Research Laboratory. It has been in development since 2005 and is the size of a large dog “or a small mule,” says the company. BigDog’s legs mimic an animal’s legs, and are able to absorb shock and recycle energy as the machine moves around. It is powered by an engine which drives a hydraulic pump to send oil under high pressure around its plumbing in order to animate its limbs. In a video created by Boston Dynamics, BigDog is seen lifting a breeze block with an arm attached to where the head would go on its animal equivalent, and then throwing it backwards. “The goal is to develop techniques for using the strength of the legs and torso to help power motions of the arm,” posted the company underneath the video. The mechanical “dog” is already able to move about a varied, rugged terrain while carrying a load. It can perform simple tasks and obey voice commands. Chris Melhuish, director of Bristol Robotics Laboratory, told the BBC it was “a phenomenal piece of technology”. “It’s cost a lot of money, but you tend to spend a lot of money on first prototypes, and later on as these things get rolled out, they get cheaper,” he said. Chris Melhuish added that the robot’s ability to follow a person made it “an interesting navigation machine which might end up useful in other domain, such as search and rescue”. “[Imagine] setting off these units across a rough terrain if they were looking for a lost child or a walker on a mountainside. “I think the potential is enormous – from pets to robots that are going to help you move your shopping, to a robot on a building site that’s moving bricks from one place to another, following a bricklayer around. BigDog is one of a range of robots developed by Boston Dynamics, among them the Cheetah – a headless machine that is able to reach 28.3 mph (45.5 km/h) on a treadmill, faster than the fastest human.